Those of us who live in Southwest Florida are incredibly lucky to have such an abundant variety of sea and wildlife. For a painter like me, it’s tremendous because there’s never a lack of subject to choose from when planning a painting. My flamingoes, pelicans, egrets and fish are among some of my most popular (and bestselling) motifs. 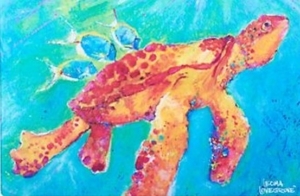 But one of my personal favorites are the turtles that populate the waters off Sanibel, Pine Island and Matlacha Island. 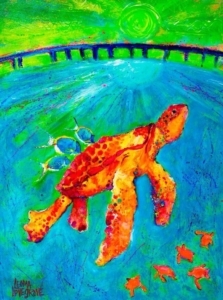 There are a number of different turtles here in Southwest Florida, but the loggerheads get the most attention. 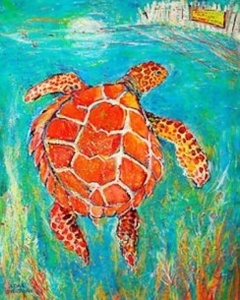 Each May, female loggerheads instinctively return to the beach where they were born and dig deep pits in the sand to serve as nests for their clutch of eggs, which typically number over 100. Momma turtle doesn’t mess around. As quick as she can, she buries her eggs and returns to the safety of the Gulf. The eggs hatch in about 80-90 days. The baby loggerheads head straight for the water, but most don’t make it before falling into the clutches of predators, particularly birds of prey. It’s a tricky proposition, and even the slightest delay or hesitation can spell the difference between survival and becoming some predator’s lunch or dinner. For example, lights facing the beach can confuse a hatchling and cause it to head inland rather than to the water. And hatchlings don’t negotiate obstacles like beach chairs all that well. While loggerheads get the most publicity, we have dozens of other varieties like green sea turtles, snapping turtles, spotted turtles and leatherbacks. They’re all a pleasure to paint. If you’re interest in one or more, come visit us at Lovegrove Gallery & Gardens. You might even spot a live turtle or two around the corner in Matlacha Park.